The SMM has been present at the border less than 0.1 % of the time. The OSCE Mission has observed more than 30,000 individuals in military-style dress crossing just at the two checkpoints to which it has access, the US Representative to the Organization for Security and Cooperation in Europe (OSCE) Ambassador Daniel B. Baer said at a meeting of the OSCE Permanent Council on 17 November. In a statement on the website of the US Mission to the OSCE Baer highlighted the problems with access of observers to the border. "The reality is that the OSCE is barely present on the Ukrainian side of its internationally-recognized border with Russia. Since October 31, when the Special Monitoring Mission to Ukraine first began reporting the amount of time it spends at the border, the SMM has been present at the border less than one tenth of one percent of the time," the statement reads. "The SMM is not even able to visit, on average, more than a single border crossing per day. And, when the SMM arrives at a checkpoint, it stays on average only 33 minutes - and only during daylight Because it takes SMM patrols more than three hours to drive to the border, monitors must drive past numerous separatist checkpoints, giving combined Russian-separatist forces plenty of time to ensure there is nothing of consequence for. the SMM to see once it arrives at the Ukrainian border with Russia," the US diplomat said. "Despite the strict limits imposed on the Observer Mission's mandate and operating procedures, the Mission has still been able to document Russia's destabilizing and destructive activity in eastern Ukraine. The Observer Mission has observed more than 30,000 individuals in military-style dress crossing just at the two checkpoints to which it has access," said Baer. 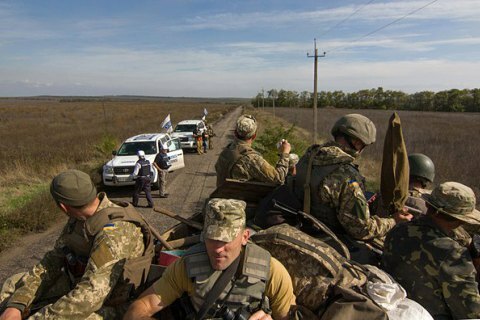 "These individuals reportedly receive weapons once they arrive in separatist-held parts of Ukraine Twenty uniformed persons crossed the border in a single bus with tinted windows in mid-October, according to Observer Mission reports," said the US representative to the OSCE. On 27 October, the OSCE monitors in Hukovo saw an ambulance with "200" marking crossed the border with Russia. During the conflict in Donbas the SMM witnessed over 20 of such facts.